Beyonce, Jay-Z and more attended the 30th Annual GLAAD Media Awards last night(March 28th) at the Beverly Hilton Hotel in Beverly Hills, CA. Logan Browning struck a pose wearing PATBO long sleeve blue plush velvet, floor length dress, featuring a pleated plunging neckline and draped pleated waist. A complimentary beauty look and ESTABLISHED jewelry finished up her look. Olivia Munn wore a custom YANINA COUTURE semi-sheer black peacock, velvet gown. I can't say that I favor this gown on Olivia, it is not that flattering on her. It's the bottom half that's throwing things off but her beauty look is flawless. 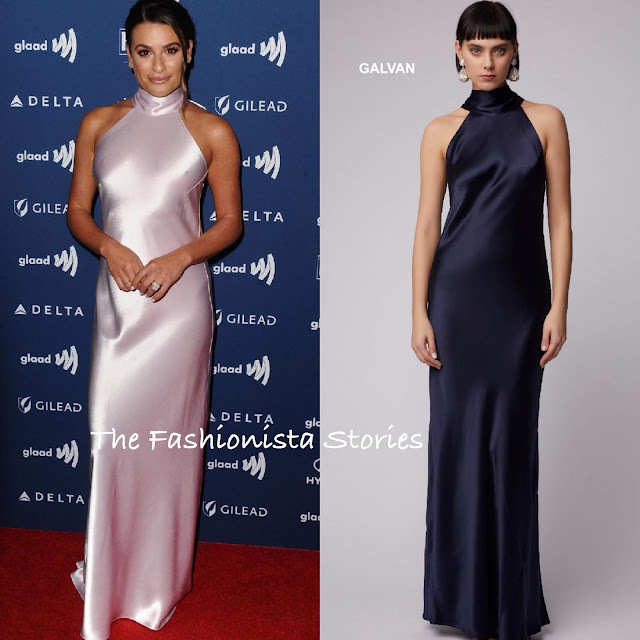 Lea Michele who is fresh off of her honeymoon, posed on the carpet wearing the GALVAN 'Sienna' silk bias cut halter slip dress, featuring a neck tie in the back. 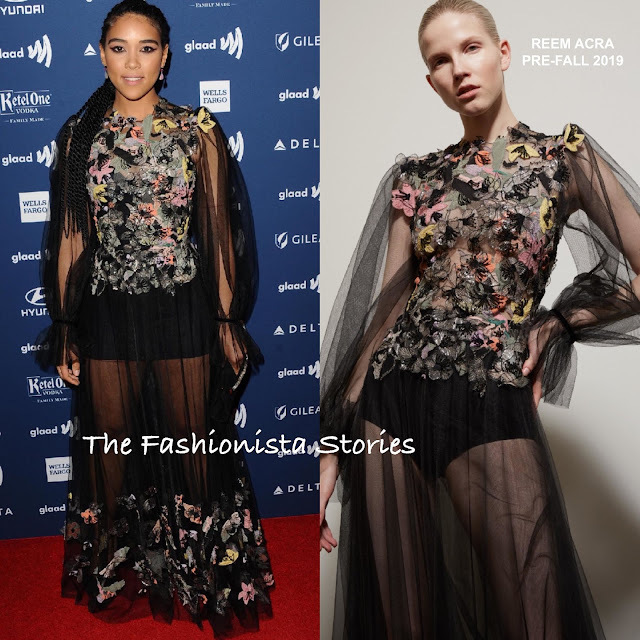 Alexandra Shipp wore an REEM ACRA PRE-FALL 2019 black sheer long sleeve gown with 3D embroidered flowers and CASADEI sandal. I am not loving this gown on Alexandra and I actually prefer the briefs in the look book over the bottoms that she is wearing. 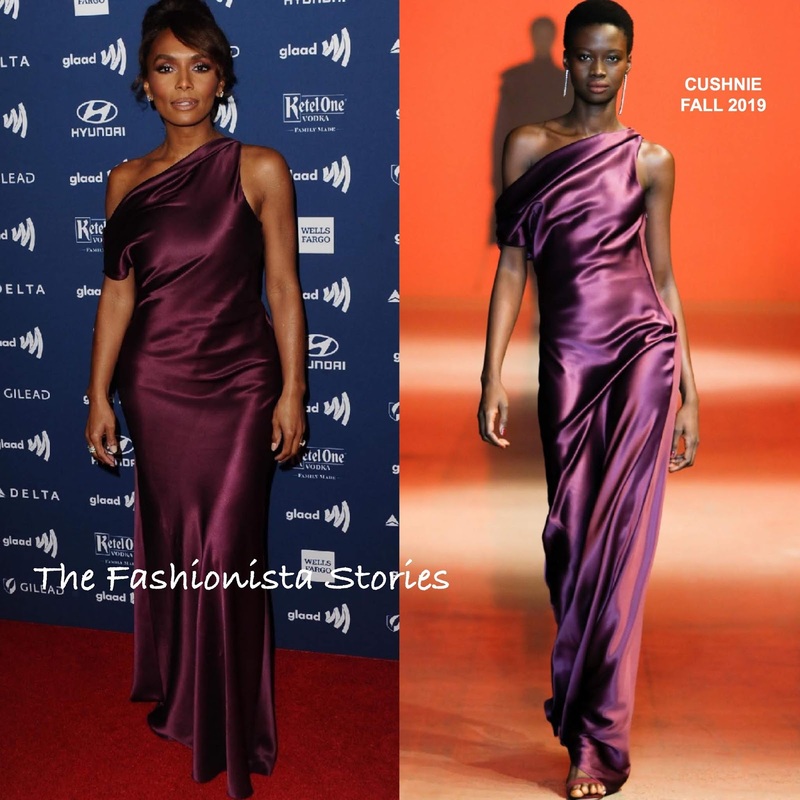 Janet Mock continues to be a style force on the red carpet, as she looked divine wearing a CUSHNIE FALL 2019 plum draped one-shoulder silk-crepe gown. NORMAN SILVERMAN jewlery and a complimentary beauty look rounded out her look. Allison Janney stood out wearing a SALLY LAPOINTE FALL 2019 red sequin, dolman sleeve dress, which stopped just below her knees and featured a small slit. Her black TYLER ELLIS clutch and JIMMY CHOO sandals were safe accessory choices but her ROSE ARK earrings coordinated perfectly.